I’m Your Father pulled off a remarkable win in the Busan Mayor’s Cup on Sunday afternoon, defeating Dubai hero Triple Nine by half a length to give New Zealand trainer David Miller a huge victory in Busan’s biggest race. Grand Prix winner Clean Up Joy was sent off as favourite but despite overcoming gate 2 to get a good start, it was not to be his day. Returning with a swollen hind leg, he looked to have been feeling it for much of the race and had little to offer in the home straight, coming home in 9th place. The early pace was set by last year’s winner Beolmaui Kkum with Success Story going along for the ride too. At one point beginning the long turn for home, the pair had put almost seven lengths into the field but with Beolmaui Kkum not at the level he once was, it was never likely to last. I’m Your Father and Triple Nine meanwhile sat patiently at the head of the chasing pack waiting for the leaders to come back to them. They came back at the top of the straight. By this time it was clear that Clean Up Joy was labouring and wouldn’t be taking part in the business end of the race. Success Story lingered longer than Beolmaui Kkum but under Lee Hee Cheon, I’m Your Father struck the front just over a furlong out. Only Triple Nine, under the urging of Jo In Kwen, could go with him but he couldn’t quite get there. I’m Your Father maintained his pace to the line and jockey Lee had time to celebrate as they broke the wire with a half length in hand. Saengil Gippeum, Jiljuui Sin and Ms. Margaux all closed deeply to finish 3rd to 5th while Diferent Dimension, like Triple Nine in his first start since returning from Dubai, put in a very creditable 6th. Clean Up Joy aside, Champ Line was perhaps the disappointment of the race. The 5-year-old entered having won his last five but had an off day. Mupae who was also relatively well-backed, reportedly took a knock coming out of the gate and struggled throughout. For jockey Lee Hee Cheon, it was a 2nd group win following his victory on Never Seen Before in the 2014 Minister’s Cup. Lee doesn’t get a huge amount of opportunities at the elite level but he rarely disappoints when he does – he also rode Macheon Bolt to 2nd place in the Korea Sprint last year. As for David Miller, it is a stunning success. He began training at Busan last autumn and has steadily built up his stable but is yet to acquire the kind of firepower needed to achieve sustained success. Nevertheless, his place and show rates are good (12.2% and 20.4% respectively) and his horses have consistently been finishing better than their odds have suggested. His success with I’m Your Father will perhaps put potential owners on alert. Next week the big race action moves to Seoul and the final leg of the Triple Crown, the Minister’s Cup. Korean Derby winner Final Boss is expected to face the surprise Oaks winner Jejui Haneul over 2000M. Their paths now collide in what is often called the “Summer Grand Prix” over 1800M at Busan. All eyes will be on the start. A notoriously troubled starter, at Seoul Clean Up Joy (Purge) has special dispensation to begin in the widest gate and not having a horse on his outside has settled him down enormously in his most recent appearances. At Busan he is afforded no such special treatment and indeed in last year’s race, he blundered coming out of gate 5 and could only rally late for an eventual 4th. This time he is in gate 2 but most seem to think that under Djordje Perovic, Clean Up Joy can overcome. As for Triple Nine (Ecton Park), the two time President’s Cup winner has had a rest since arriving back in Korea in April and cantered through a trial last week looking in shape and ready to go. It’s not necessarily a two horse race though. The Thomas Gillespie trained Champ Line (Curlin) enters on a five-race winning streak and only looks to be getting better. He has a great draw and could well be a factor. Then there are the up and comers. Kiwi trainer David Miller saddles the highly thought-of I’m Your Father (Tiznow) in his first Group race and the colt is not without a chance. Not is Triple Nine’s stablemate Mupae (Paddy O’Prado), who has won five of six starts to date. 1. NORTHERN VICAR – Maiden win at the 7th time of asking in April but only beat one home on first try at this class three weeks ago. 2. SWAG – Landed maiden win on Good Friday and was 2nd last start over 1000M. Hasn’t gone well at further than the minimum in the past but in the frame here. 3. MUNHWA DAERO – Up in class following maiden win over 1300M last time. That win had been coming and there’s not too much to fear here. Repeat not impossible. 4. WIDAEHANGWANGGYONG – Yet to win but has come close on several occasion including latest two. Steps back in trip from a mile today and should come close again. 5. CHEONJIGAEBYEOK – Struggled in three efforts since maiden win saw him promoted to this level. 6. RED SIREN – 4th at class and distance last start and should be looking to at least match that today. 7. SEONGGONG PLAN – Not beaten many in four attempts at this level. 8. YEOKJEONUI GIHOE – A winner on his second start on June 9th, beating two who have since gone on to perform well. Up in class and distance today but a real chance. There was talk she was to be retired after winning the Queens’ Tour last year. Some retirement. Gamdonguibda, a six-year-old mare, romped home ahead of a whole host of big names and reputations to take the glory in the Busan City Mayor’s Cup this afternoon. Beolmaui Kkum was out of the gate the quickest – no surprises there – and was quickly joined up front by Oreuse and Cowboy Son. However, today would not be a day for the front-runners. Gamdonguibada, under jockey Lim Sung Sil was away well and settled just behind the leaders. She improved into 5th entering the home straight and as the early leaders fell away, took advantage and sprinted away to win by four lengths on the line. Spring Gnarly, closed from the back to take 2nd while outsider Heba put in a tremendous performace to grab 3rd. Cowboy Son clung on for 4th while pre-race favourite Gyeongbudaero got the final prize money in 5th. Gamdonguibada was a $31,000 purchase from Ocala in 2011. Today marked her 14th career victory and took her to over US$2Million in prize money at the current exchange rate. She’s won the Grand Prix Stakes and Ttukseom Cup at Seoul as well as the Gyeongnam Governor’s Cup (twice) and the KNN Cup at her home track of Busan. Gamdonguibada’s next engagement is scheduled to be at Kranji in Singapore on July 26. Should she go, she will be up against it, dropping down to 1200M and facing a quality of horse she hasn’t before. Tonight though, in terms of prizes and longevity, she is quite simply the most successful filly or mare to have ever run in Korea. As for the others, Spring Gnarly made it a one-two for trainer Kim Young Kwan while Gyeongbudaero was late arriving on the scene and is now three races without a win as is Beolmaui Kkum. Oreuse showed at the front early and will surely win plenty of races at shorter distances with the Asia Challenge Cup at Seoul in August the logical target. Cinderella Man was disappointing but will surely be back better. On the subject of the Asia Challenge Cup, next week we have two trials for it; the Munhwa Ilbo Cup at Seoul and the Gukje Sinmun at Busan which is likely to feature Success Story and, making her first start since relocating to Busan, Fly Top Queen. Twilight racing also begins next weekend with the first race at Seoul being 13:00. It’s the summer Grand Prix! Fifteen horses will line up at Busan on Sunday afternoon for one of the highlights of summer, the Busan Metropolitan City Mayor’s Cup. Only two have made their way down from Seoul – credit to their connections for having the courage to make the journey – but the home team more than makes up for it with a veritable who’s who of the track’s older horses turning out for the race. Well done to connections for actually sending him and saving Seoul from absolute disgrace but he unfortunately has no chance here. He was last in the winner’s circle in October 2012 and hasn’t run at all since January. A huge chance. 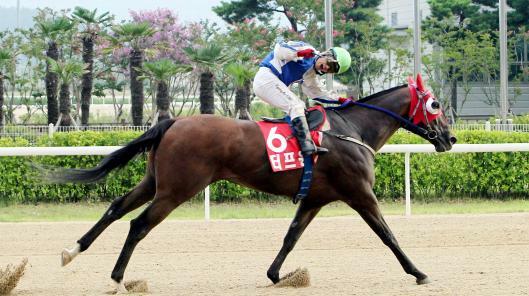 After five straight wins he was 2nd to Gumpo Sky but beat Gyeongbudaero and Spring Gnarly over 1800M on May 31. 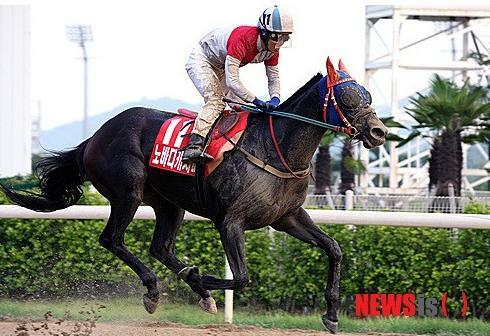 At just 4, he is one of the up and coming stars of Korean racing and he surely has a big race win in him. It could be today. The winner of that race against Cinderella Man, Gyeongbudaero and Spring Gnarly, he is to be respected. He led from gate to wire that day and back at a mile today will probably try to get to the front early again. He has a chance. The President’s Cup and Grand Prix Stakes winner. He is probably one of the finest racehorses ever produced in Korea and while he hasn’t won his past two races, he has been giving weight. He will be close to the pace and he has a chance of winning yet another big race here. He was a very creditable 3rd in this race last year when it was run at 2000M. That becomes even more creditable when you consider that if today’s race was shorter, then he would be very hard to beat. Cowboy Son is a sprinter and against this caliber of opposition, a mile may just be too far. A real chance. On his only start so far this year, Oreuse was second to Cowboy Son over six furlongs. Similar to Cowboy Son he is most at home as a sprinter but has won over 1800M too. Likely to be close to the front early on,this is another horse who has a big win in him. The second of Seoul’s contenders isn’t any more likely than the first although his last win was slightly more recent. Not in anything resembling form and unlikely to be competitive here. He always must be considered and he is another who will surely appreciate not giving his opponents as much weight as usual. The highest rated horse in Korea, he likes to lead from the front but it has been very difficult to do that and stay on in recent big races (Jangpung Parang in the Oaks an exception). Japanese rider Nobuyuki Oyama gets a great opportunity in the saddle. A multiple Stakes winner, she comes in here following her first victory of 2015, beating Heba by two lengths. She drops back to a mile for the first time since winning the KNN Cup last year and will try to come from just off the pace. A chance. A very consistent money-winner, he comes in following a victory over Eongmandori in a quick race over this distance although he has been beaten by many of the others who go here in recent starts. He won’t be among the favourites but could provide some value for a place. Beaten by Chogwang last time out, he hasn’t actually won since April 2013 and never at class 1. He won’t win this either and despite being consistently in the money – he beat Gumpo Sky over 2000M in April – will find it tough today. Still a class 2 horse, he takes his chance here but this is a big step up to what he is used to. Plenty of potential to become a class 1 winner at some point surely not today. Last seen inadvertently smoothing the way for Esmeraldina in the Ttukseom Cup at Seoul, Heba is a consistently reliable race mare who is perhaps one notch below the top level. She has been beaten by most of her rivals here in recent starts and any kind of money finish today would be an achievement. Another one making a big step up, Baksuchyeo raced for the first time this year three weeks ago, scoring his first class 1 win in the process. It was over 1400M and took him to 6 wins from 9 career starts but he will be a big outsider today. It’s risky to refer to any horse as being Kim Young Kwan’s second string as they usually have as much chance as the supposed first. However, he was beaten by Gumpo Sky, Cinderella Man and Gyeongbudaero last time out. The only real closer in the field, he has good late speed and can be a danger here.